Like, far-out, daddy-o! 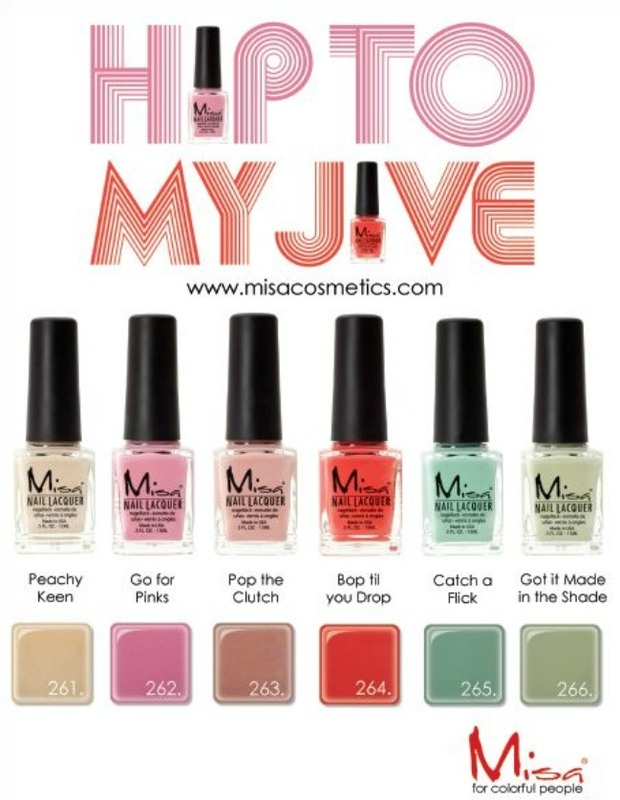 Misa Cosmetics’ fall collection, Hip to My Jive, will have you flipping out over shades that hearken back to the decade of old-school cool while ensuring that your nails remain of-the-moment. The ’50s brought us TV dinners, cruising in chrome-accented automobiles, and poodle skirts at the malt shop, but now they bring forth six retro-inspired hues that’ll knock your socks off! Peachy Keen: You don’t have to be a square to appreciate the necessity of perfectly polished nails. This champagne-hued taupe is a flattering neutral that’ll go with everything in your closet, from full skirts to sweetheart sweaters. Take this shade from the office to after-hours—it’s guaranteed to make a soft, feminine statement. Go for the Pinks: Thinking pink? Throw your hair into a ponytail and put on your girliest nail color. Perfect for going steady—or meeting the parents!—this muted but statement-making matte rose lends a girly-girl flair with an irresistible high-gloss finish. Pop the Clutch: Nothing’s more liberating than grabbing the keys and taking a ride on the boulevard—except perhaps this rosy brown hue with a hint of iridescence. Put the top down, slide the key in the ignition, crank up the tunes, and tap out your favorite rock-and-roll beats on the steering wheel with perfectly polished nails. Bop Till You Drop: Go ahead, stay out all night; this vibrant shade will ensure that your nails make a statement from early evening into the wee hours. One warning, though: This shimmering orangey coral will definitely outlast any partner you can find down at the dance hall. Catch a Flick: Getting swept away in your favorite Hollywood plots at the drive-in is a perfect pastime, but you’ll want to keep your nails firmly rooted in reality. Just try to tear your eyes away from this cool mint green to watch the movie! Got It Made in the Shade: Whether in the heat of an Indian summer or lounging as the leaves turn for autumn, this fall, make sure you’ve got nail color that’s laid-back yet oh-so-hip. Perfect for hanging with the greasers or dancing at the sock hop, this unique olive green will keep your nails cool—and hot—all season long. 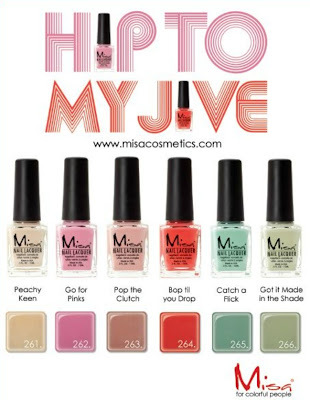 Misa offers more than 164 nail lacquers that provide the richest and most intense coverage possible in nail color. An exceptionally high concentration of pigment, as well as mica, in a professional-grade formulation ensures that Misa colors last and last without chipping, wearing or fading. And unlike many polishes that can thicken with age, Misa nail lacquers stay perfectly mixed for a smooth, streak-free and even finish—even years after first use. Misa continues to upgrade products, including the use of revolutionary nanotechnology. This nanotechnology helps Misa develop polishes that are smoother, resulting in a surface that allows light to reflect evenly. Nail polish performance is enhanced through ease of application and removal, high gloss, higher abrasion resistance and better stability. Better adhesion allows for longer-lasting results. Safety is also a prime objective; therefore, Misa no longer uses DBP, toluene or formaldehyde chemicals in any of its nail lacquers. A unique 230-strand polish brush fits in the hand—just right for a steady polishing job—while the elegant and sturdy base ensures the bottle won’t tip. Discriminating nail professionals and colorful people everywhere have requested Misa since 1996. Beyond seasonal collections, Misa offers an impressive array of frosts, sheers, French manicure and nail art colors for year-round indulgence. I really like Catch a Flick and Got it made in the shade. I got these yesterday, and I absolutely love them! This line delivery in Brazil?